Zibbit's Chess Blog: Carlsen playing the English! Is the English Opening gonna be his main weapon in England? Well he has used it in his first two rounds of the London Chess Classics. 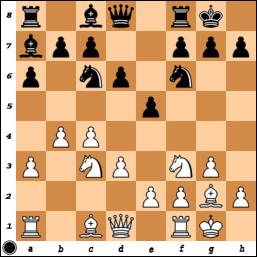 Here Adams played 9...Be6 but Marin considers ...Bf5 and ...Bg4 to be the main moves. He says "9...Be6 exposes the bishop to the knight jump Nf3-g5. There has only been on egame with this move between reasonably strong palyers 10. Bb2 Ne7 11.Ng5 Bc8 12.e3 h6 13. Nf3 we are back into the normal paths, since Black has played ...h6"
Carlsen however went for Nd2, Rb1, a4, b5 a build up on the queenside and a slow strategic struggle typical of the English was the order of the day. Carlsen managed to outplay his opponent after some inaccuracies by Adams. In the 4th round against Nakamura he again played 1.c4. Nakamura answered with 1...f5. I personally like playing the Closed Sicilian Reversed with white against KID and Leningrad setups but in the Marin books he goes for the Botvinnik system (d3/e4/Nge2 etc). Carlsen instead went for another type of English setup, with e3/Nge2 and another quiet buildup. In the end black was left with typical weak pawns on b- and d- file and Carlsen managed another win.